South Australia’s Minister for Environment and Conservation, Water and the River Murray, Paul Caica, hosted an official reception for high-level delegations from Thailand and the Mekong River basin at State Parliament in November. 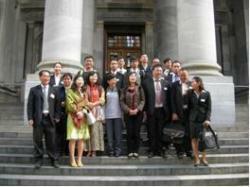 Led by Mrs Asdaporn Krairapanond, Director of the Office of International Cooperation at the Ministry of Natural Resources and Environment, the Thai delegation – which was in Australia for an ICE WaRM study tour – also held face-to-face discussions with the Minister, exploring opportunities for further water resources management programmes and exchanges involving the two countries. The Thai delegation was made up of 13 representatives from the Ministry of Natural Resources and the Environment, the Department of Water Resources, the Royal Irrigation Department and a hydro-power specialist from the nation’s Electricity Generating Authority. The Mekong River group included staff from higher education institutions specialising in water resources management training and research, together with water management agency staff from five countries. As he welcomed the delegations, the Minister highlighted the contrasting water resources issues facing Australia and south east Asia and emphasised Australian experience and expertise in water management, including the delivery of specialist programmes through ICE WaRM. Ironically, as Australia is recovering from severe drought, the Minister acknowledged that Thailand was experiencing damaging floods. He also focused on many similarities between the countries and their shared interest in water management challenges. The Minister is looking forward to continuing discussions with his counterparts in Thailand and the greater Mekong region.